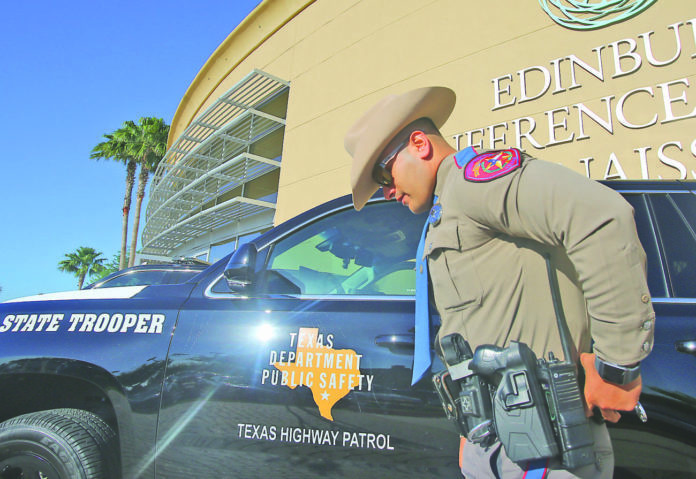 EDINBURG — Law enforcement from across the state gathered here with members of the community Tuesday night for a prayer vigil in support of Texas Department of Public Safety Trooper Moises Sanchez. Sanchez, 48, was shot twice shortly before 9 p.m. Saturday after responding to an automobile accident on North 10th Street and Freddy Gonzalez Drive in McAllen. He remains in stable but critical condition at Doctors Hospital at Renaissance. Faith leaders led songs and prayers at the vigil, which was held inside at the Edinburg Conference Center at Renaissance, and colleagues spoke of how they knew him. Edinburg Police Chief Cesar Torres, for instance, shared that Sanchez coached their kids in baseball and basketball. Speakers recognized the different shades of uniforms in the room. Officers of various agencies sat toward the front of the auditorium supporting the Sanchez family in front. “We are a family tonight — a family that has come together under difficult circumstances to do what families do — support, love, be vulnerable, comfort and pray together,” DPS Regional Director Jose C. Rodriguez III said. Cesar Cuevas, field director for the Texas Department of Public Safety Officers Association, said he was appreciative to see more than 100 people waiting before a blood drive started this morning. For hours after the shooting, local agencies cooperated in the Edinburg manhunt. It wasn’t until between 12:30 and 12:50 a.m. Sunday that Edinburg police arrested suspected shooter Victor Alejandro Godinez, 24. He faces life in prison on three counts of attempted capital murder of a peace officer. Godinez is the suspected driver of one of the vehicles in the crash Sanchez responded to, and fled the scene on foot for an unknown reason before allegedly opening fire on Sanchez after the trooper caught up to him in the 1500 block of South Maltese Street in Edinburg. In the parking lot, vehicles from the different agencies represented parked next to each other in a show of unity. Organizers said they originally envisioned a small gathering of solidarity, but the outpouring of participation quickly necessitated a larger venue. DHR helped accommodate on their campus. While the event was at least partly a response to negative comments targeting law enforcement, speakers did not address that. They instead took a positive tone, often speaking of their faith. “This vigil is not a mourning,” Cuevas said. “It’s not a place to feel defeated. Rodriguez told a story about law enforcement leadership and his doctors gathered outside Sanchez’s hospital room.